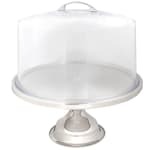 Tablecraft 821422 Cake Stand & Cover Set, 12 3/4 x 13 3/4"
Cake Stand & Cover Set, 12 3/4 x 13 3/4"
"We will be using this product to display our fresh baked muffins and cookies each day. I think the quality and price combined....make this an ex..."
"We had very high cakes, that would not fit in your department store cake stands and cover. We tried putting each slice of cake in a container an..."
"We will be using this product to display our fresh baked muffins and cookies each day. I think the quality and price combined....make this an excellent deal!" "We had very high cakes, that would not fit in your department store cake stands and cover. We tried putting each slice of cake in a container and displaying in our case DID NOT SALE WELL. Got this cake stand and cover, now have problem keeping our cakes on hand."